A Chromebook is any portable personal computer that comes with the Google Chrome OS software installed in it. This has many implications primarily for the software as this differs from a traditional personal computer that ships with a standard operating system like Windows or Mac OSX. It is important to understand the purpose of the operating system and its limitations before deciding that a Chromebook is a suitable alternative to getting a traditional laptop or even a tablet. The primary concept behind the Chrome OS from Google is that the majority of applications that people use today are based upon using the Internet. This includes things like email, web browsing, social media and streaming video and audio. In fact, many people primarily do these tasks within the browser on their computer. As a result, Chrome OS is built around the web browser, specifically in this case Google Chrome. Much of this connectivity is achieved through the use of Google's various web services such as Gmail, Google Docs, YouTube, Picasa, Google Play, etc. Of course, it is still possible to use alternative web services through other providers just as you would through a standard browser. In addition to the applications primarily being web-connected, the storage of data is also assumed to be done through Google Drive cloud storage service. The default storage limit of Google Drive is typically just fifteen gigabytes but buyers of a Chromebook receive an upgrade to one hundred gigabytes for two years. Normally that service costs $1.99 per month which of course will be charged to the user after the first two years if they are using over the standard free fifteen-gigabyte limit. Now not all the applications are dedicated to being run completely from the web. Many people need the ability to edit files while they are not connected. This is particularly true for the Google Docs applications. The original release of the Chrome OS still required that these web applications be accessed through the Internet which was a major inconvenience. Since then, Google has addressed this by producing an offline mode on some of these applications that will allow editing and creation of select documents that would then be synced up with the cloud storage when the device is then connected to the Internet. In addition to the standard web browser and application services available through it, there are some applications that can be purchased and downloaded through the Chrome Web Store. These are in essence the same extensions, themes, and applications that one can purchase for any Chrome web browser running on the various operating systems. As the Chrome OS is essentially just a limited version of Linux, it can run on just about any type of standard PC hardware. (You can install and run the full version of Linux if you like.) The difference is that Chrome OS is specifically vetted to be run on hardware that has been tested for compatibility and then released with that hardware by a manufacturer. It is possible to load an open source version of Chrome OS on just about any PC hardware through a project called Chromium OS but some features may not work and it is likely to be somewhat behind the official Chrome OS builds. In terms of the hardware that is being sold to consumers, most of the Chromebooks have elected to go a similar route as the netbook trend from the past decade. They are smaller, very inexpensive machines that provide just enough performance and features to be functional with the limited software features of Chrome OS. The average system is priced between $200 and $300 just like the early netbooks. Probably the biggest limitation of the Chromebooks is their storage. As the Chrome OS is designed to be used with cloud storage, they have very limited internal storage space. Typically, a Chromebook will have anywhere from 16 to 32GB of space. The one advantage here is that they use solid state drives which means that they are very fast in terms of loading up programs and data that is stored on the Chromebook. There have been a few options that use hard drives which sacrifice performance for local storage. Since the systems are designed to be low cost, they offer very little in terms of performance. Since they are generally just using a web browser to access web services, they do not need a lot of speed. The result is that many of the systems use low-speed single and dual-core processors. While these are sufficient for the basic tasks of the Chrome OS and its browser functions, they do lack performance for some more complicated tasks. For instance, it is not well suited to doing something like editing a video for uploading to YouTube. They also do not do well in terms of multitasking because of the processors and typically smaller amounts of RAM. 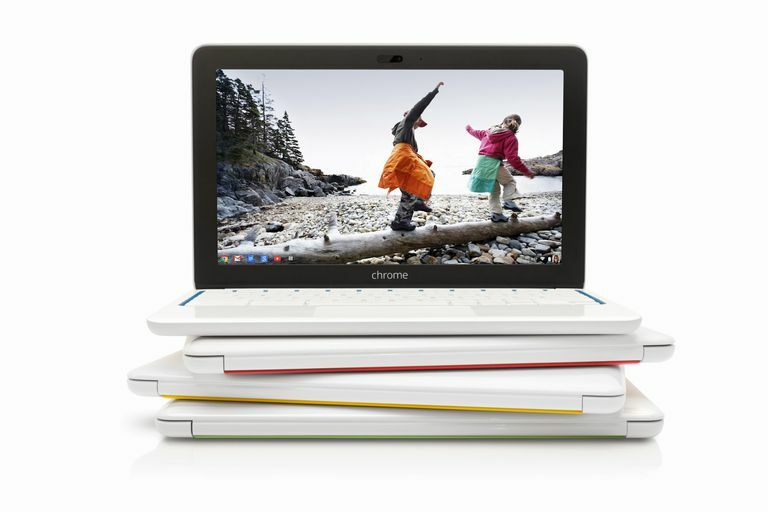 With the goal of the Chromebook being a low-cost portable computing solution that is designed for online connectivity, the obvious question is why buy a Chromebook over a similarly low cost, connected computing option in the form of a tablet? After all, the same Google that developed the Chrome OS is also responsible for the Android operating systems that are featured in many tablets. In fact, there is probably a larger selection of applications available for the Android OS than there are for the Chrome browser. This is particularly true if you want to use the device for entertainment such as games. With the pricing of the two platforms being about equal, the choice really comes down to form factors and how the device will be used. Tablets do not have a physical keyboard and instead rely on a touchscreen interface. This is great for simple browsing of the web and games but it is not very effective if you will be doing lots of text input say for email or writing documents. For instance, even right-clicking on Chromebook takes a bit of special skill. A physical keyboard is much better suited for those tasks. As a result, a Chromebook is going to be the choice for someone that will be doing lots of writing on the web compared to someone that will be mostly consuming information from the web.